My BRP experience was truly one of a kind. As I headed into my last semester of college, I knew I would soon be on my own and finally in a position to own a puppy of my very own. After much research and consideration, I determined that a Doodle was the perfect match for me and quickly found Patti and Andy online. Reading the many reviews from overjoyed BRP owners truly helped me feel like I was making the right decision. So allow me to share with you just how my experience went. After emailing Patti with an inquiry, I soon received a call, followed by a long conversation making sure that a BRP would be the right fit for me. The focus of our conversation was uncovering exactly what I was looking for in a puppy to make sure I was on the right waiting list. When choosing a puppy, I knew I wanted a male and preferred an F1B generation Doodle. I wanted him to be smart, energetic, and loving. A puppy I could take with me on the many adventures my young professional life would take me on. Patti and I decided I should wait on two lists to make sure I would get a male this past spring. Much to my surprise, I ended up being first on the waiting list for Odessa’s very first litter! To many this may not seem significant, however, this allotted me the opportunity to have a very special pup, a Black and Tan Brindle Phantom colored F1B Goldendoodle. The adventure truly began here, as I never imagined that I could make him mine. However, Patti talked to me almost daily over the first few weeks and as our relationship grew, she made it possible for me to choose Hudson as my little man. Many photos and 8 weeks later, I finally got to meet my beautiful puppy and I cannot say enough about how evident it was that he was truly cared for and raised in the best possible environment for those first 8 weeks! Our litter’s Facebook group allowed me to stay in touch with Hudson’s volunteer care takers and the other puppy parents—giving me lots of advice on training and transitioning him to his new home. Hudson is now almost 6 months old and a successful graduate of Kindergarten Puppy School, earning the AKC’s STAR Puppy Certification. He continues to amaze me with how smart and lovable he truly is! I could not be happier with my decision and love being a part of the BRP family! Thank you Patti and Andy! This is Mia. 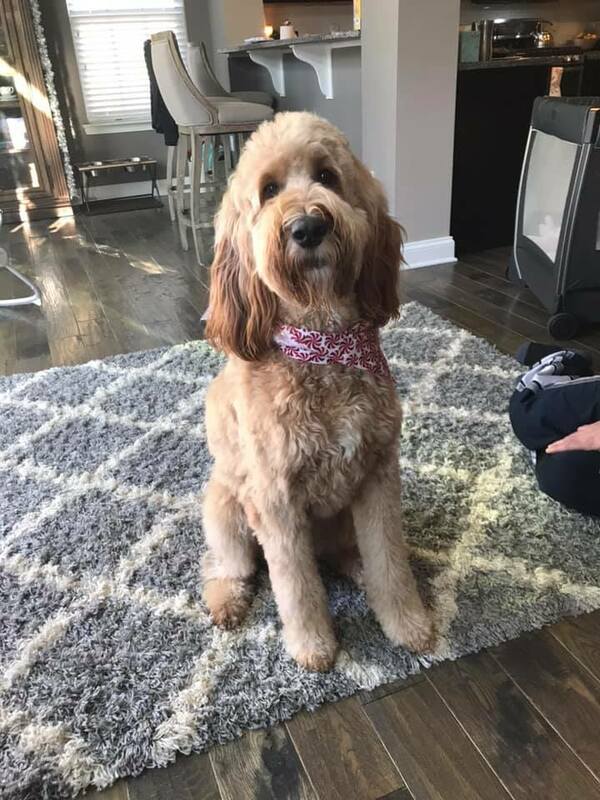 She is an F1b Goldendoodle and very loved. She loves to swim, is an amazing lifeguard when kids are in the pool, she gives family hugs and is an all around amazing addition to our family. Patti’s pups are THE BEST! We are so lucky to have found such an amazing breeder that sends home the greatest puppies. From the beginning of bringing home Tucker, he already could sit and knew that outside was where you go potty. He has brought much love, light, and laughter to my husband and I.
Tucker is a pleasure and a very smart boy. 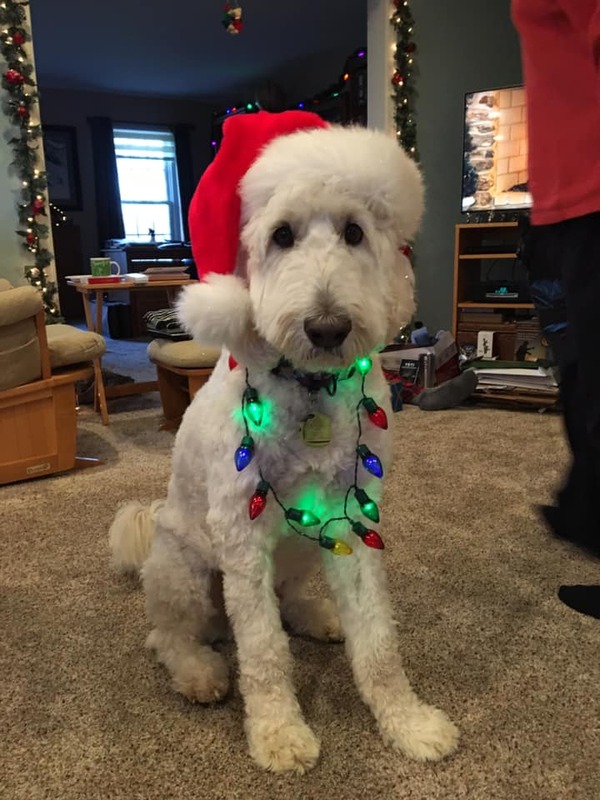 When walking Tucker, it is not out of the ordinary that someone stops us to tell us what a beautiful dog he is or how they have never seen a white Goldendoodle. We have even had cars driving by stop to get out and meet him. Tucker sure does love all the attention! Thank you Patti and Andy for blessing us and helping our little family grow. So thankful we found you, Briar Ridge! 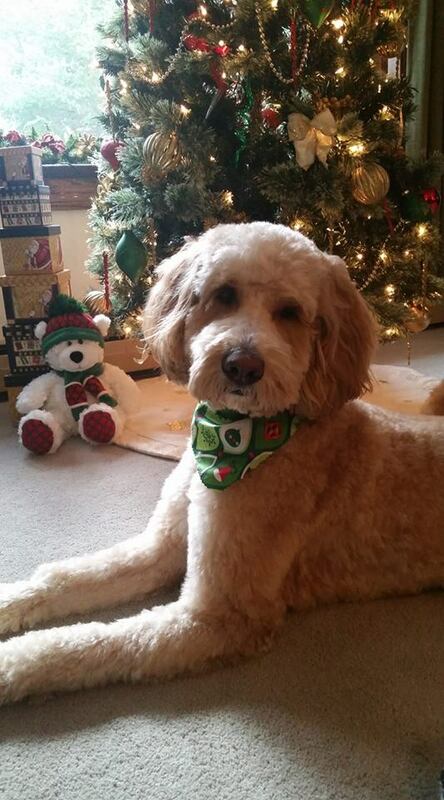 This is Finny he is an Irish Doodle and he is the best dog ever. He is so smart, eager to please, and loving. He is great with children and other dogs. 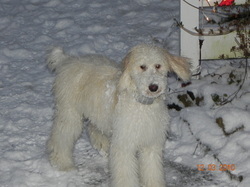 We are so glad we chose BRP as our breeder because Patti made sure his temperament would be a great fit for our family. 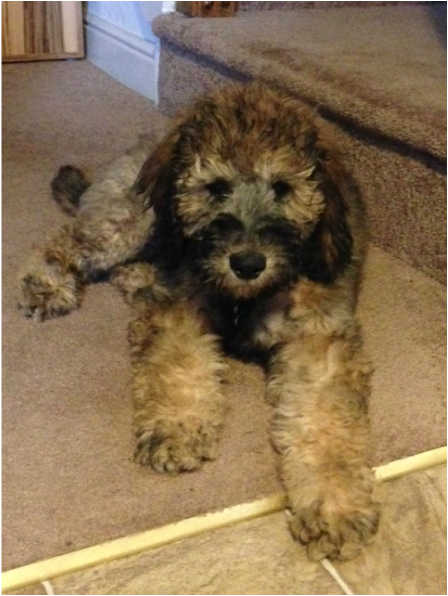 We want to thank you first for blessing us with such a beautiful Irishdoodle puppy!!! We would never have guessed that Issa would be fully potty trained when we brought her home at 8 weeks old!!! She has been great with our other dogs, company and us. She brings us such joy everyday and her personality & temperment are perfect! Oh, forgot to mention she is pretty smart too! For anyone looking for a reputable breeder who truly cares about the health and welfare of the puppies and their parents, then you have found them with BRP. Patti and Andy truly go above and beyond to produce top quality breeds. It was worth every penny to travel from Arizona to PA to get such an amazing dog. 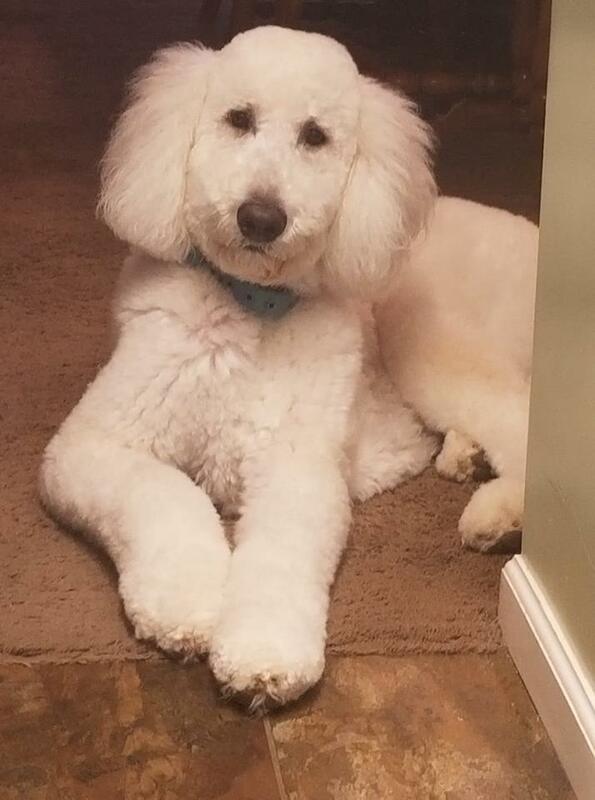 This is Toby, an F1B English Creme Doodle. He is the best companion, loves people and has an amazing personality--he makes us laugh quite often. 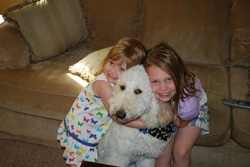 Last year our Goldendoodle (from a different breeder) passed away at the age of six due to kidney failure. Molly was smart, friendly, easily trained, and we loved her dearly. We soon decided that, not only did we miss Molly, we missed having a dog. So I began to do some research and received multiple recommendations for BRP. When I called Patti and gave her my story, she was empathetic and understanding; she also spent about 45 minutes on the phone with me talking about how she cares for and loves her dogs. One of our main concerns was that we would never find another dog as smart and pleasant as Molly was. We were wrong. 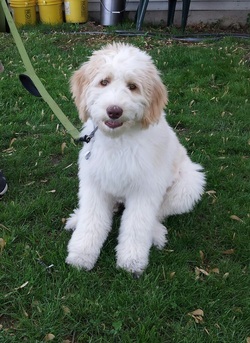 Our 6 month old BRP puppy, Daisy, is smart, friendly, playful, and very social. She has been easy to train and at times has appeared to pick up training cues after a single exercise. When speaking to Patti, she told me that, in her experience, the new family gets the dog they are supposed to get. She was exactly right. Daisy is a great addition to our family and exactly the dog we had hoped for. We are happy to be part of the BRP family and Daisy is delightful! 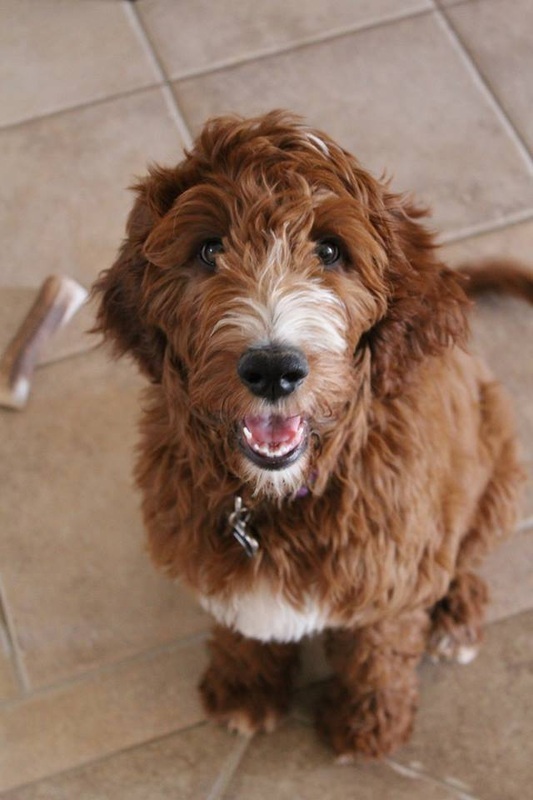 In your search for a doodle you have found the right site, BRP, and the perfect breeders! Patti and Andy breed their puppies with love, knowledge and needed attention...so much so that I've gotten 2 of these amazing dogs. 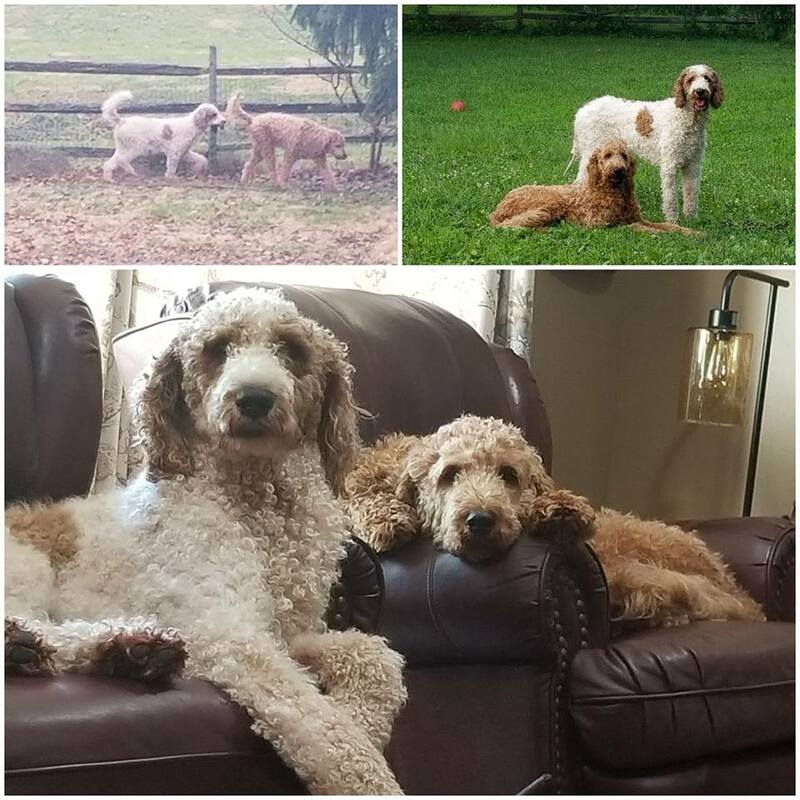 Flynn (red one) is a 2yr old f1 Irish doodle and Brody (white parti one) is a 2 1/2 yr old f1b Irish doodle. They are just the best behaved and smartest dogs! Patti and Andy start their training and, honestly, they come to you almost potty trained. For all of those questions you will have with your new puppy you are provided a take home DVD that provides all needed information to successfully raise a puppy. There is also the BRP family, a Facebook site where we all ask questions and share updates of our precious dogs as they grow. Patti and Andy breed all of their puppies with love and it shows in every puppy that they adopt out and their continued support of all those in the BRP family!! Also need to mention they have a bi-annual doodle romp for all of their dogs to have a chance to get together! Without a doubt, you have found the perfect breeder ever!! Franklin is the first dog our family has ever had and we are in love. He is so sweet and obedient! Since he first came home, he knew to sit and the hurry up command for using the potty outside. He was used to being handled because he had gotten so much love in his first 8 weeks. We are so thankful to Briar Ridge Puppies for their care from the day of his birth until the day he came home. They are so incredibly supportive as we've had questions and concerns. Thank you, Patti & Andy, for all you've done to provide amazing dogs for families! Patti, I really want to say THANK YOU. You went above and beyond what any other breeder would do asking these tough questions tonight and not knowing the response. 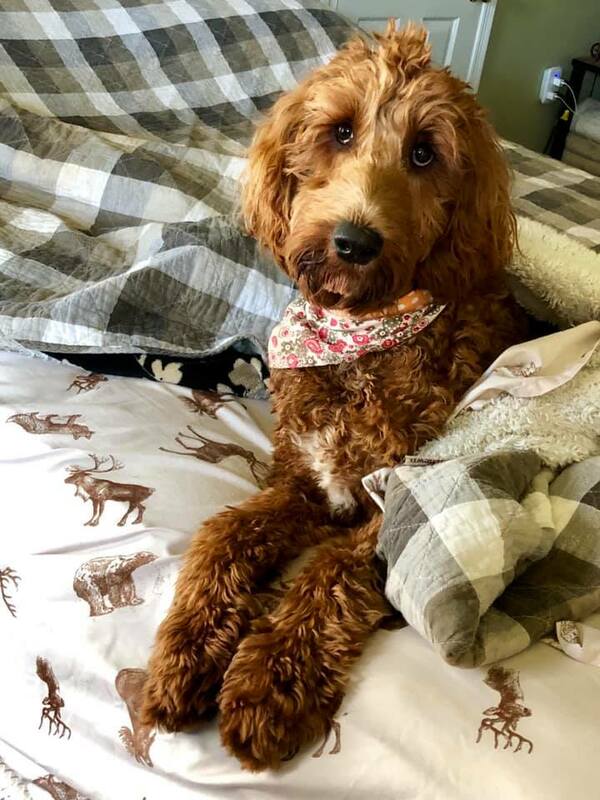 Having bought a dog in the past from a just run of the mill breeder is so very different than becoming part of your doodle family. It is so reassuring to know if I have an issue you are there as well as the rest of the BRP family to ask questions and get help. I just cant say Thank you enough!! 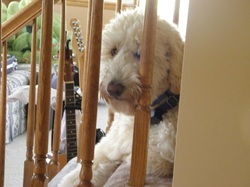 Oliver my smart, spunky, funny, big hearted, loving F1b Goldendoodle. He is very social and great with kids and other dogs. I couldn't have chosen a better breeder than Patti at BRP! This is Jack. 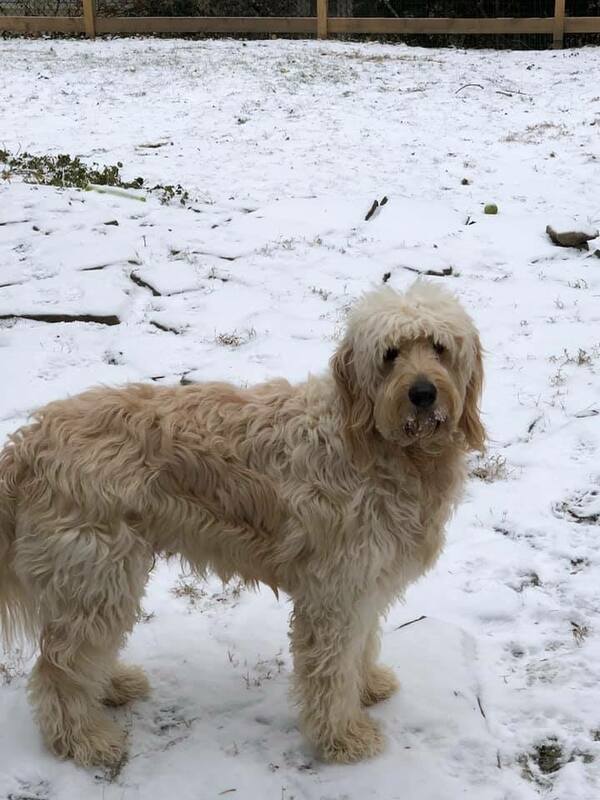 He’s and f1b English cream goldendoodle. He’s 80-85 pounds and is the most gentle, loving, smart dog. He instinctively lays on his belly near small children and rolls the a ball with his nose. We did not teach him this, he just has always done it. He loves to be with people, ride in the car, and is super intelligent. I’ve had two dog trainers and several vets marvel at how beautiful and well behaved he is. All of this is due to Patti and Andy’s wonderful breeding and care! I highly recommend Briar Ridge Puppies! These two Boys are the love of our family. They exude love, playfulness and are really, really smart. Our adult children have started a What’s App” group called “Puppy Love”. If they want or need a pick me up or a laugh, they state send us some “Puppy Love” pics. Patti and Andy you have started these puppies out with great love and care and we are the recipients of that. What a Gift!!! This is our Oliver. He’s an F1 Goldendoodle. Oliver is the sweetest, most loveable dog, and he’s absolutely beautiful. People stop us wherever we are and ask about him. Children love him. We have young teens, but any time a small child or toddler plays with him, he’s calm and willing. That’s because of the work Patti did with his litter when they were pups. We can’t say enough great things about our dog or BRP! Rosco is a Great dog and we love him so much. He has a lot of his Daddy's personality. His hair has completely changes and he really looks like a Goldendoodle now! 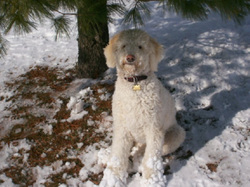 David and Robyn also added our boy, Hunter to their home when we retired him from our breeding program. Thank You David and Robyn! We can sleep at night knowing he is in a home that is as good or maybe even better than he had here with us! We just got thru Christmas with Gracie...she is great. Thanks for bring her into our family. As I am sure you know, we recently celebrated Gracie's (your orange ribbon chocolate poodle, River) first birthday. I wanted to take the time to thank you very much for your wonderful program that provided an amazing addition to our family. She is doing very well and we are forever getting compliments on her. Still, months after we've brought her home, people cannot believe how calm and laid back she is. Gracie loves, loves to play. When we are outside, she swaps between her rope, frisbee, and tennis balls; and inside it's whatever toy is out of her crate. If someone isn't in the mood to play, she goes to get another toy, almost as if she is saying "oh, you like the duck best, I'll go get that one." She's a great dog. Gracie rarely barks, it seems she only does when she really needs to go outside and no one has picked up on it. When the neighbor's dogs are outside for a walk, she sits politely on the driveway in hopes they'll stop by to play. At night, when she is tired and we're watching TV, she'll 'snuggle' up with a toy and lay on the backs of my legs or my back, just as she did the first night we brought her home. My brother and sister joke that I'm her pillow. I hope all is well, I check your site all the time to see the new puppies; they're so adorable!! Again, thank you very much for everything you did for Gracie in those early months. I am forever grateful to Briar Ridge Puppies. We were very, very lucky to find you. The. Best. Dogs. Ever! We have 2 BRP’s. We love them both with all our hearts. They are healthy, happy, friendly dogs. They are all lovingly well-bred in a clean, and caring environment. 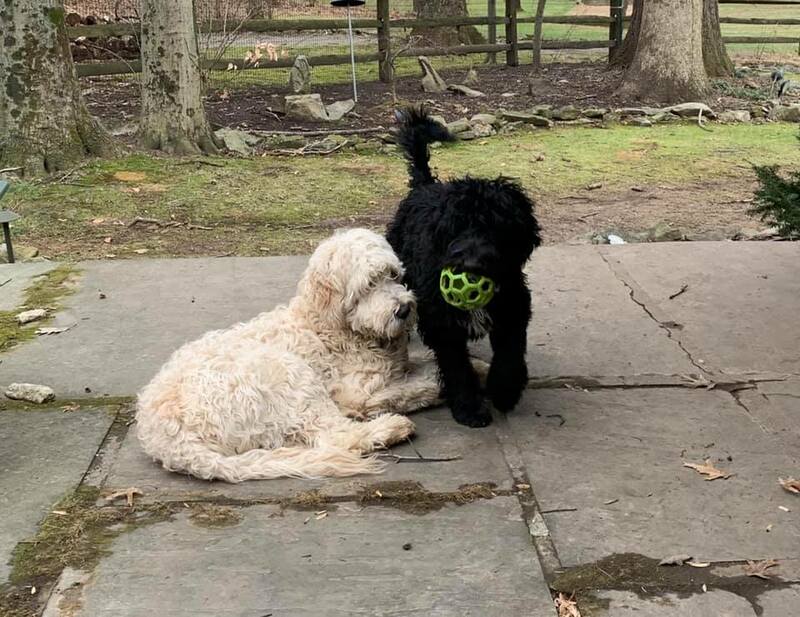 Seamus is a Irishdoodle and Sonny is a (black) Goldendoodle. It’s all about the dogs at BRP. 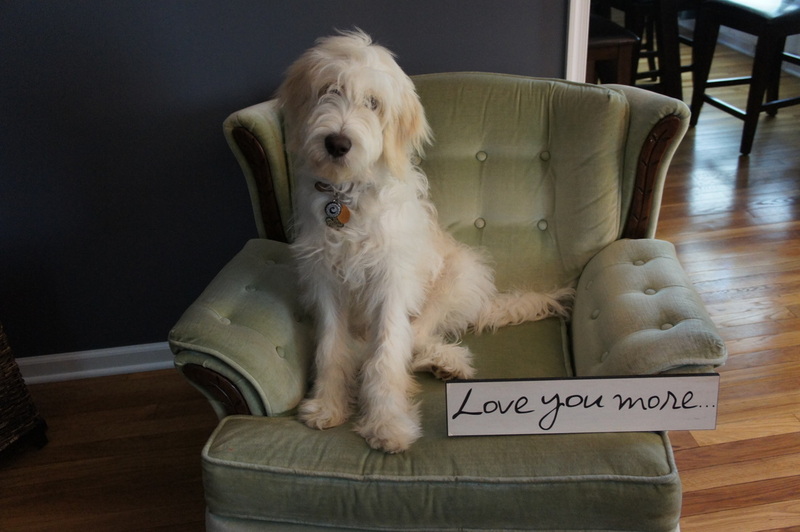 First and foremost, thank you for doing such a beautiful job raising these goldendoodle puppies. We had heard such horrible stories about breeders running puppy mills, and are so thankful we found you and Andy. You both made this such an enjoyable experience. They are so wonderful and sweet and we love them to pieces! 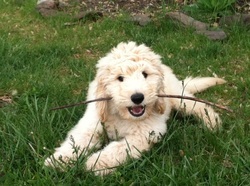 This is Gracie, our F1b Goldendoodle. She is the nicest, smartest, happiest, sweetest dog. She is interested in everything around her,listens beautifully, and was so well-trained when we brought her home as a puppy. Briar Ridge Puppies , Patti and Andy, devote themselves to an honest, ethical, kind, and knowledgeable breeding of these amazingly special puppies. 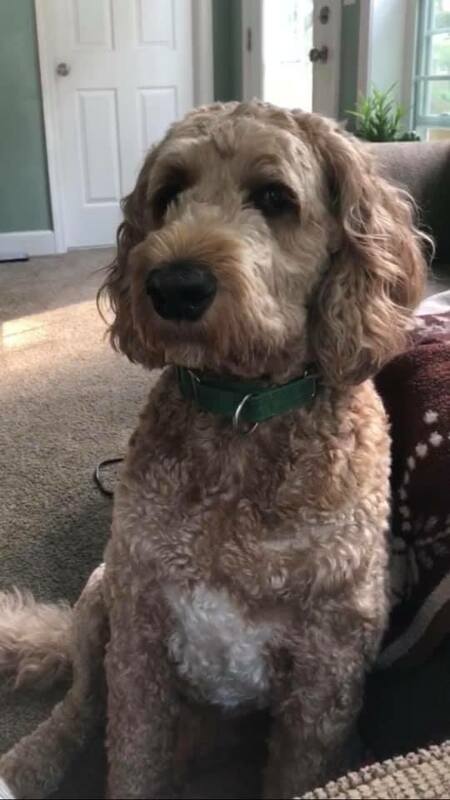 ​Marc & Lizes..anyone should be absolutely blessed to have a BRP join their family..
_Just wanted to let you know that Woodle-Jones, our Goldendoodle puppy did wonderful on the ride home yesterday. In fact, we had a great first day home!! He has not had one accident in our house yet. He almost had one this morning but only because I didn't read his cues (he was barking wildly and walking around...didn't go to the door as he had before...he started to go #2 and I picked him up and rushed him out the door...success!!). He is going to EVERYONE in our family, visitors, people at the vet, etc!! His vet appt. was phenomenal...got his toe nails clipped and never flinched...vet clipped hair around his eyes (same thing-no flinching). He even sat on the metal table without revolting. I have NEVER had a dog just sit on that table like that!!! Woodle-Jones is the BEST dog we have ever had! We all Love him very much. He is our BELOVED Puppy and has made our family complete!!! Thank you again Patti and Andy and Briar Ridge Puppies!!!! Last night I had a dream that we got another puppy because Jones is such a delight. Never thought I would entertain that idea. 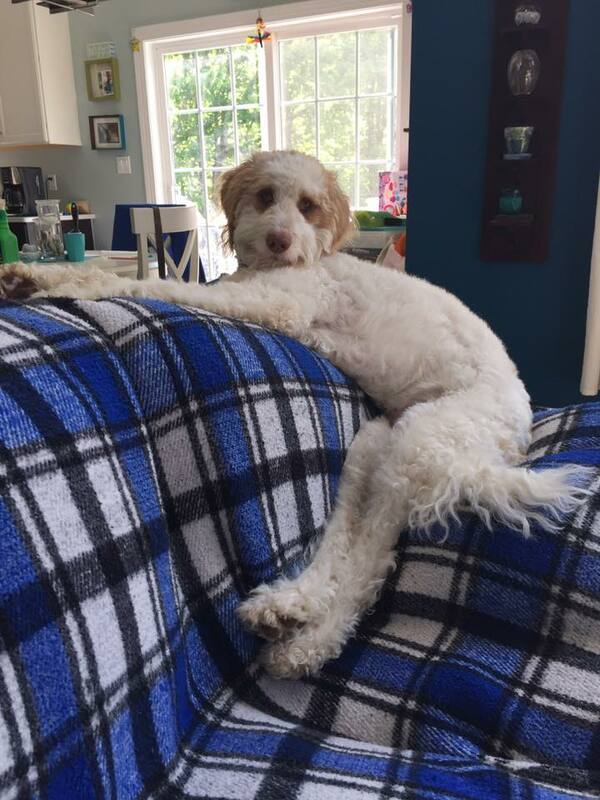 Not only does Patti (Briar Ridge Puppies) Breed the most beautiful and socialized doodles ever, she is the most amazing and compassionate breeder we have ever purchased a dog from. She stays in contact to help you with any of your concerns thru the life of your dog. She even does get togethers for all the dogs and families and her (she is so happy to see all her babies again). This shows her true love for every puppy that she breeds. Her dogs are her family and every single one is treated above and beyond with the best care possible. She sticks with the standards to the breeds to maintain health in her lines. We love her and we feel so fortunate that she trusted us with one of her puppies! We love our irishdoodle, she is absolutely beautiful, with the best temperament and health! Thank you Briar Ridge Puppies, we are happy to be part of the family! _Patti has been awesome. I feel so comfortable that we have picked Briar Ridge Puppies. 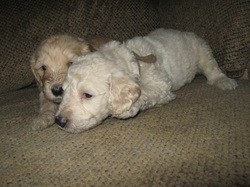 They are the "Monks of PA" and will be our only Breeders for Goldendoodles! This is Bentley! He is a therapy dog that loves to give kisses and snuggle up with you. He provides therapy work at Harrisburg International Airport and does Reading therapy with first graders at Kunkel Elementary. We wanted to Thank You both for being such Great Breeders! Your Love for the puppies show in your actions and the puppies themselves. We looked at several places that ended up being Puppy Mills. So GLAD we found you, you will be our ONLY Breeders. 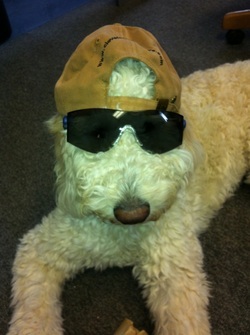 Harley is an F1 goldendoodle and absolutely the best dog ever. She is so amazing with children and loves her family unconditionally! Winston is the best dog! He is so smart and easy going, everyone loves him. 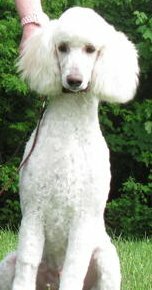 I am so impressed with him, let me know when you have more Standard Poodles as I want another and am willing to wait for one from you. 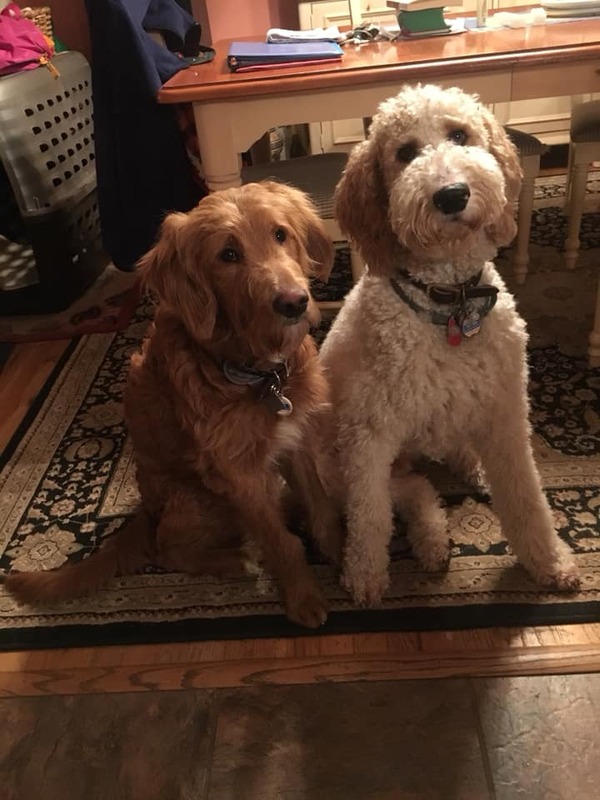 ​Meet 2 1/2 year old Rollo and 6 month old Mabel, both F1b goldendoodles. We loved Rollo so much, we just had to get a second BRP. They are so kind, sweet, cute, playful, funny, and absolutely wonderful with kids. To sum it up: the best dogs ever. _KC is the Best dog, Love my little buddy. He does like to tease Debbie by taking her yarn and running out the doggie door with it! He knows when it is time to go to work and is the most well behaved dog in the truck, no matter where we are. 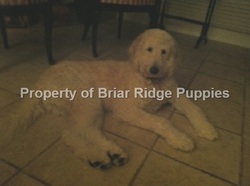 Looking forward to coming to visit Briar Ridge Puppies soon! _Abby is the best dog we have ever had, Really! She will let you do anything to her, and as you can see, Adam does. She loves everyone and is so well behaved. We really couldn't ask for a better dog. 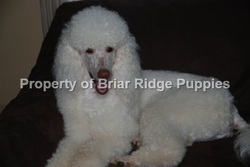 We will bring her by soon for a visit at Briar Ridge Puppies! We feel so fortunate to have found BRP! Andy and Patti were with us every step of the way during the selection process. In fact, now, 6 yrs later, the BRP community has become family. The care that Andy and Patti give their puppies during the all-important first few weeks is innovative and exceptional. Not only is Zoe beautiful and healthy F1, but she is the most intelligent, laid back, funny and loyal dog we've ever owned. She makes us laugh every day and has enriched our lives. Thanks you BRP! 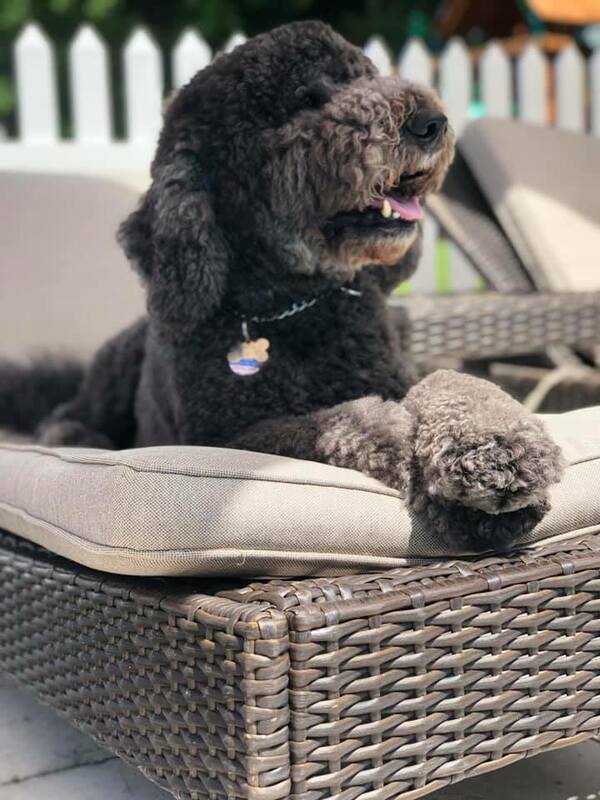 During the entire process, it was clearly evident that Briar Ridge Puppies (and Andy and Patti) took pride in operating with professional standards coupled with a true passion for their dogs. They encouraged visits to their home, and that openness demonstrated attention to every detail from basic care, to socialization, to early training. In three weeks I was there four times to visit with my future puppy. Each time, the puppies were freshly bathed and behaved with confidence that comes from positive attention and positive exposures to new experiences. After we brought our puppy home, Briar Ridge Puppies continued to offer encouragement, support, and advice in navigating those first few weeks of transition. Louie came home at 8 weeks mostly house trained, mostly able to sit on command and toy responsive to the point that we played fetch our first night home. He was so well socialized that he would follow family members off leash when we played outside! 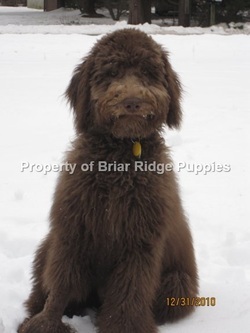 I will only consider a puppy from Briar Ridge Puppies in the future! The cost is more than reasonable when you bring home a healthy puppy that has so many good habits already engrained from their early weeks. Louie is the first dog I’ve ever had. I spent well over a year researching and looking into breeders and kept coming back the the BRP site.. it really is a testament to the dogs you raise how many people are so loyal! Everywhere we go we have people commenting on how great Louie is.. the sweetest, gentlest soul, amazing with kids and other dogs.. My vet even asked for your info, Patti!!! Everyone comments on how “lucky” we are to have such a great dog, but I don’t think its luck  the resources you provide as a new dog owner were amazing. We truly can’t imagine our family without Louie!!! 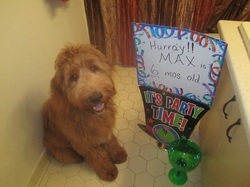 It is hard to believe that Max will be 6 months old soon. He is a sweet, smart and very social puppy both with humans and other dogs alike. When we are out he gets his fair share of attention because of his friendly, outgoing personality. People compare him to a teddy bear. That being said, he is a happy, healthy puppy because of Patti and Andy at Briar Ridge. They are exceptional breeders. They put so much into their puppies on a 24/7 basis-love, caring, nurturing and yes, even training.. There main concern is always that their puppies go to good loving homes. Once you have a Briar Ridge Puppy, you are a member of their family forever--for that I will always be thankful.